These are the brothers and sisters you prayed for. They send their love with thankful hearts! 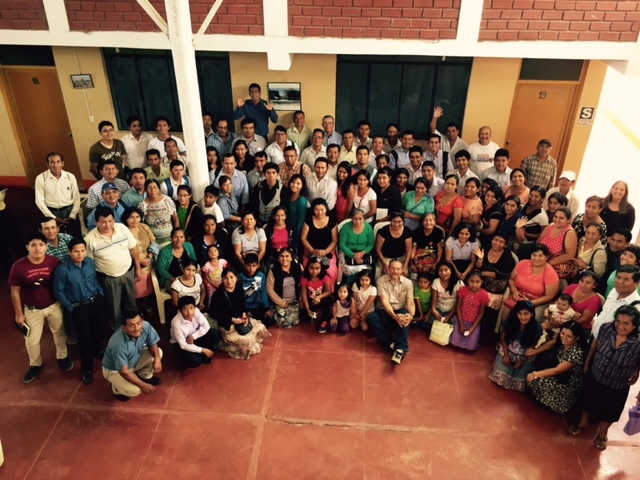 Thanks to your prayers and God’s amazing grace we have finished the first Peru conference in Tambogrande! As we arrived on the first morning, many pastors came to greet us and say, “We want to be better servants of God, but we need more teaching to enable us to serve properly.” Their spiritual hunger got us off to a good start. Gene taught on “The Inexhaustible Riches of God’s Grace,” starting with salvation “by grace through faith” (Eph 2:8), and moving through God’s grace in our Christian life, service, and reward. It was one of the most relaxed and interactive groups we have ever taught overseas, with 118 attendees—mostly pastors and church leaders from 27 different churches. Their response to principles of God’s grace, some of which they had never heard before, was encouraging. Many of you know what it feels like to be freed from the burden of legalism, so you can understand their joy in receiving a clear understanding of God’s Word! Please pray for the seminary students in this area. Julio teaches them on a weekly basis and they often rise at 3 a.m. to get their work in the mango fields completed by 6 p.m. so they can then attend the seminary classes. Pray for a permanent meeting place for the seminary. Pray for Pastor Ramon—he is in need of a church building. Pray for Nathalyna— she is a young woman who has just come to Christ and is going blind in one eye. Pray for Lady. Her husband was a pastor but recently deserted her and her family. She is in great pain and need. Tomorrow we leave for the two-day journey by bus and four-wheel-drive vehicle into a jungle area on the headwaters of the Amazon. Please pray for our safe travel, and for the teaching at the next conference in Saramariza.